The most obvious place has got to be the wildly famous “Roti Mataba” place at the corner of Phra Athit, exactly opposite the giant fort. The tiny two-storey shophouse has been home to the most popular Malay style Muslim food restaurant for decades. The roti mataba’s here are legendary and you can smell them being cooked freshly from miles away. If possible, find a table downstairs where you can watch the ladies fry up the different types of rotis (yes, they do have banana pancakes), but only at your own risk of smelling like onions, garlic, and curry powder for days. 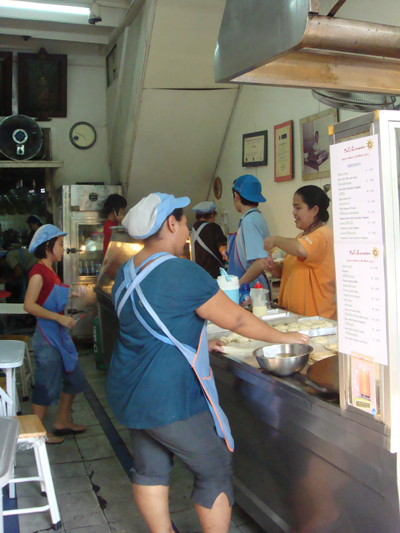 The second floor is air-conditioned but lacks the vibrant atmosphere of the open-air restaurant. Be prepared to wait in line for a table if you come during lunch or dinner. The restaurant is open until late-ish and great for picking up a greasy late night snack. The noodle shop a couple of shophouses down to the west from the Roti Mataba place is also handy for a quick and cheap lunch. Various types of noodles and fish/pork/beef balls and everything in between are cooked freshly and will set you back an amazing 25 baht! 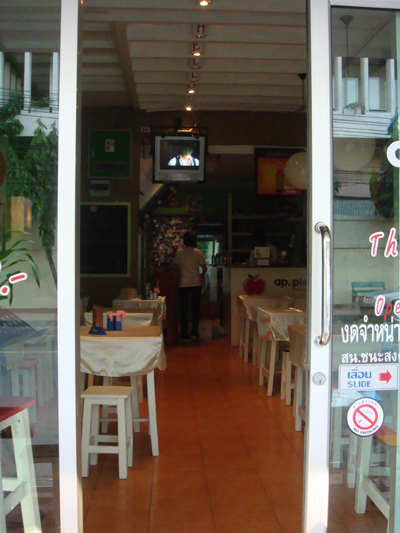 Other staple Thai dishes like fried rice, omelet, and pad thai are also available here. During lunch, it is packed with mostly office workers from around the area. Just opposite the park is another old favorite. Krua Nopparat is slightly more upmarket than the other two places and offers the much-needed air-conditioning, especially in the summer. Thai and Chinese-style dishes are good here. Keep walking up and you’ll come across an open air beef noodle place that seems to be particularly popular with Korean tourists. Don’t let the pungent smell put you off. The noodles and the beef broth are simply awesome. 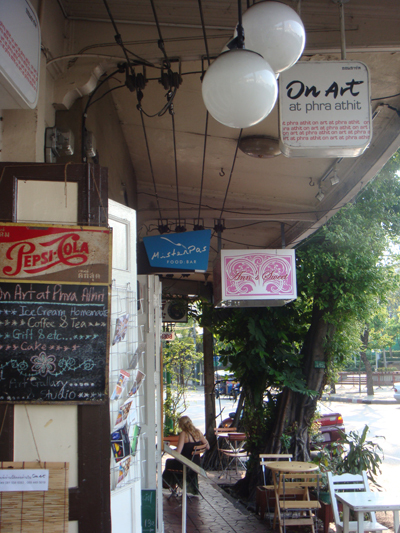 The restaurant with the most amazing views in the area is not actually on Phra Athit road, but tucked away in Soi Samsen 3, accessible via a rather dodgy walkway just behind the guesthouse. The Gin Lom Chom Sapan ( Eat Wind View Bridge, literally) is packed every night, mostly with the well-to-do Thai food lovers in search of fresh seafood and fine view. Expect to p ay between 800-1000 baht for 2 persons. But if you’re on a tighter budget, fear not. Just like most streets in Bangkok, Phra Athit offers a fantastic array of street food that tastes just as good as in fancy restaurants and costs less than half!